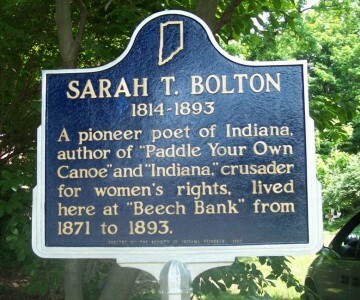 Sarah Tittle Barrett Bolton (Dec. 18, 1814 - Aug. 4, 1893), poet, born in Newport, Ky., was the daughter of Jonathan Belcher and Esther (Pendleton) Barrett, pioneer settlers of Indiana. Her grandfather, Lemuel Barrett, was an Englishman who emigrated to New Jersey some time before 1754, and her mother's father, a cousin of James Madison. Her early days were spent in the wilderness, about six miles from Vernon, Ind., where her father had staked a farm. Of this period her poems entitled "Our Pioneers" and "A Pioneer Grandmother" are reminiscent. When she was nine, her father sold his farm and moved to Madison. Here she got some knowledge in the schools, and as much outside. Before she was fourteen, verses from her pen had been published in the Madison Banner, and she soon became a regular contributor to the newspapers of her home town and Cincinnati. In her seventeenth year, October 1831, she married Nathaniel Bolton, a young newspaper man, and went to live in Indianapolis. Thereafter her life was shaped by her husband's fortunes until his death in 1858. He was first editor of the Indiana Democrat; then proprietor of a farm outside the city, his house there a tavern which became a stopping place for distinguished men and something of a social center, Mrs. Bolton acting as housekeeper and cook, besides running a large dairy. Later he was state librarian, then clerk of a United States Senate committee, and finally consul at Geneva, which appointment gave Mrs. Bolton opportunity for extensive travel. Two children were born to her. About five years after his death, she married, Sept. 15, 1863, at Keokuk, Iowa, Judge Addison Reese, and for the next two years lived with him at his home in Canton, Mo. The climate there was not favorable to her health, and she returned to Indianapolis, where she made her home until her death, though she spent two or three years abroad. She was always known as Sarah T. Bolton, and used the name "Reese" only for business purposes. Her writings and participation in public affairs made her a prominent figure in Indiana. 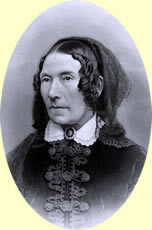 She was interested in various reforms, and was an active aid to Robert Dale Owen [q.v.] in his effort to secure property rights for women in the constitutional convention of 1850. She was a true child of the rising West, an ardent democrat and champion of freedom, full of fiery patriotism and faith in the country's future. These characteristics are reflected in many of her poems. As a whole these are of no great literary merit, but have the melody, sentimentality, and moral and religious flavor relished by the fireside magazine readers of their day. Paddle Your Own Canoe and a few others had wide popularity. Poems appeared in 1865, and a collection of her writings with a sketch of her career was published in 1880 under the title, The Life and Poems of Sarah T. Bolton. A volume of selections,Songs of a life time, edited by John Clark Ridpath, was published in 1892. It contains an introduction by Lew Wallace and a poem by James Whitcomb Riley. [Ladies' Repository, Feb. 1852, pp. 69-73; Wm. W. Woollen, Biog. and Hist. Sketches of Early Indiana (1883); J.P. Dunn, Greater Indianapolis (1910); obituary in Indianapolis Sentinel, Aug. 5, 1893; and information furnished by Mrs. Adah Bolton Mann] H.E.S. In the world's free fight?